Women's Original Gloss Chelsea Boots is rated 4.1 out of 5 by 16. Les bottes Hunter Chelsea Original sont une version ré-imaginée de la bottine classique. Prêtes à affronter la pluie, ces bottes sont fabriquées à la main à partir de caoutchouc naturel et vulcanisées pour une protection supérieure. Elles conservent les caractéristiques cultes de la Chelsea traditionnelle, les goussets élastiques et la languette en nylon permettant un enfilage et un retrait faciles. Avec leur fini lustré, ces bottines imperméables sont un indispensable des garde-robes pour temps pluvieux. Rated 4 out of 5 by Ango from Cute short boot Love me new boots I do a lot of walking on beach and on trails. They keep my feet nice and dry. I would size up as the ankles are very tight. The elastic did loosen but at first it was painful. Rated 4 out of 5 by Madi from Super cute! I can help but feel good in these boots! They are so cute and I've gotten lots of complements on them. I bought them in red and the colour is so bright and fun. I'm a size 5 and a half and I bought the size 5, they fit pretty god but I think I'll get the size six next time. I wore them all day and my feet were a little sore. But all in all very happy with my purchase! Rated 5 out of 5 by Fefe from Vibrant Yellow Colour! I got the glossy yellow Chelsea boots a week ago and wore it on a rainy day. The yellow colour was slightly different from the one displayed on my computer screen but it was still very beautiful. The only difference is that it was less shiny than the picture. It was a bit hard to take off but not too bad. Definitely wear socks with these or it will hurt if you walk for too long. I am a size 8.5 to 9 in and I got the size 9. It has a bit more room than I expected but the extra space is perfect with a thick pair of socks. Rated 5 out of 5 by Anonymous from So cute. My toddler loves them and wants to wear them inside. Easy to get on and seem to be comfy for him. Rated 1 out of 5 by Anonymous from The boots are so uncomfortable and ridiculously hard to put on but as they are final sale, nothing I can do about it. Even though they have an elastic portion it’s impossible to pry them open to jam your foot in! I found myself in a battle just to get them on even with the aid of a shoe horn. After spending so much money I’m dissappointed in the fit of the product. Wore them once and returned home in pain as the instep is so unbelievably low they were compressing my feet to the point of pain. Rated 5 out of 5 by Anonymous from It was a gift. Person who received the boots loved them. 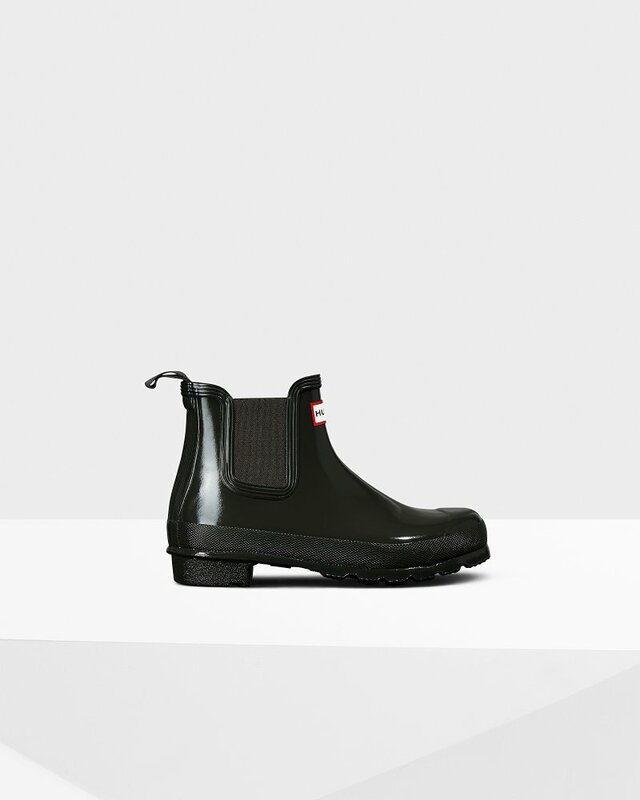 Rated 5 out of 5 by Anonymous from My wife was stoked, she always wanted Hunter boots.